LARGE 140 LITRE SHOT BLAST POT KIT. GREAT FOR LARGE SITES WHERE POT MANOUVERABILITY IS ESSENTIAL .... BRIDGES, WAREHOUSES, MILLS. POWER STATIONS, HARBOURS, FACTORIES, ETC . ONE MAN CAN GET IN OR OUT OF VAN ..... THIS POT HAS 'PRAM' TYPE HANDLE WHICH MAKES THE TASK INFINITELY EASIER THAN THE LARGE LOOP ROUND HANDLES OF MANY OTHER BLAST POTS. 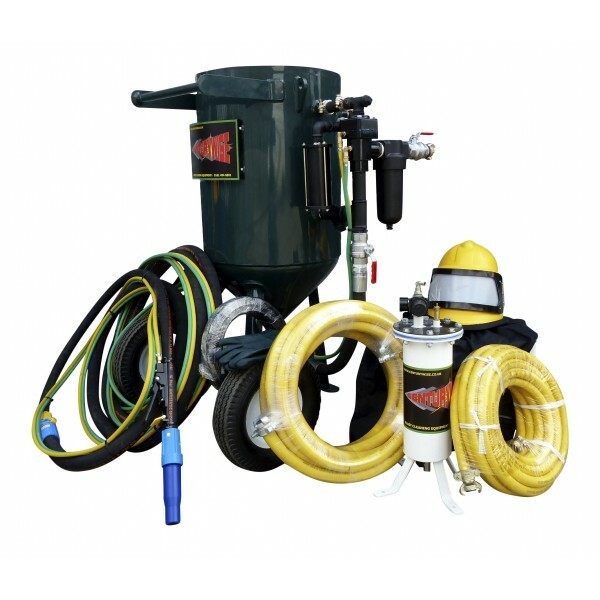 CENTURYWISE SUPPLY THE BEST BLAST CLEANING EQUIPMENT IN THE UK. REQUIRES MINIMUM 90 CFM OUTPUT AIR COMPRESSOR, BUT BEST WITH 250 CFM OR GREATER FOR DECENT PRODUCTIVITY. HOLDS APPROX. 200 KG OF MEDIA, SUFFICIENT FOR ABOUT 90 MINUTES OF CONTINUOUS BLASTING AT 100 PSI. BLAST POT IS THE ABSOLUTE BEST QUALITY AVAILABLE. MADE TO STRINGENT E.U. STANDARDS. BUILT WITH HIGH QUALITY COMPONENTS TO ENABLE CONTINOUS DAILY USE FOR MANY YEARS...... INCLUDING A REMOTE VALVE AND TO ALLOW FULL OPERATOR CONTROL FROM THE END OF YOUR BLAST HOSE. THE FINAL SPEC. IS DERIVED FROM 25 YEARS OF ON-SITE BLASTING AND LISTENING TO MANY OTHER BLASTERS' PREFERENCES..... RESULTING IN THE ULTIMATE MACHINE FOR EASE OF USE, DURABILITY, PORTABILITY AND EASY MAINTENANCE.